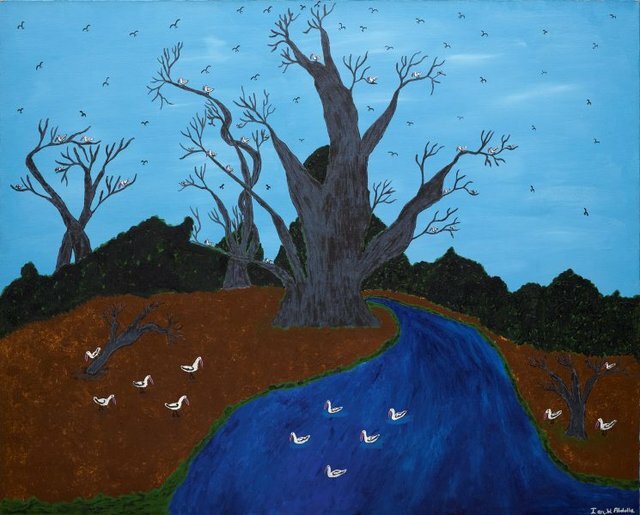 lan Abdulla's paintings vividly recall his childhood memories of the peripatetic life of the Ngarrindjeri people of the Riverland region in rural South Australia. His experiences are shared by many Aboriginal people dispossessed of their land and marginalised into a life of seasonal work and scavenging. Abdulla's richly detailed paintings offer a sense of community despite the hardships of working for a subsistence livelihood on the fringes of a wealthy white farming community. The rapid degradation of the natural resources of the region, and encroaching westernisation of Nunga communities are also as subtly constant as the ubiquitous Murray River. Signed l.r.corner, white synthetic polymer paint "IAN. W. ABDULLA". Not dated.